This D/G Saltarelle Le Bouebe was made in 2004. Saltarelle are a French company, with their instruments made under contract in Italy. I bought it second hand about 6 years ago, when it arrived the tuning was quite “wet”. 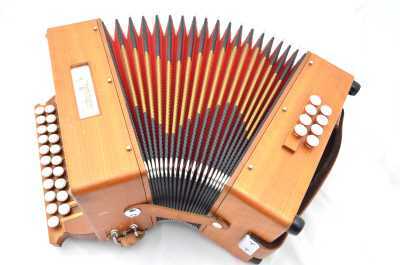 I didn’t like it much, fortunately master Adelaide based maker Peter Hyde was able to put it right with a much drier tuning, in keeping with modern European accordions. After I picked it up I put it in a suitcase for a Sydney bound flight. Bad move, two of the treble side buttons were broken off en route. Fortunately Peter was able to fashion new rods, they can be seen at the bottom left of the photo. The instrument now plays superbly. 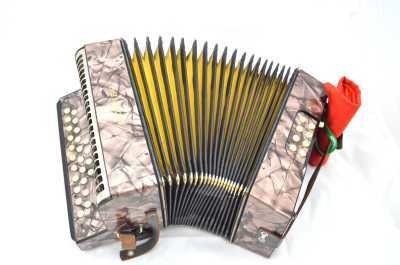 Hohner made thousands of Liliput accordions in the 1930’s. This exquisite instrument has been restored by Mike Rowbotham in England especially for Hunter. 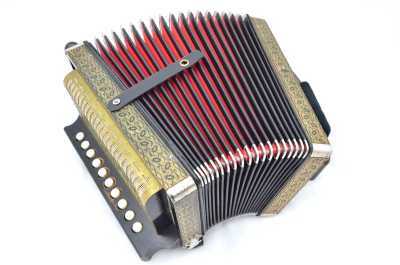 Mike’s work included changing the accordion key from C/F to D/G (via a skillful re-arrangement of the reeds), tuning the reeds up from the lower 1930’s pitch used by Hohner, re-facing the pallets, and matching the tuning exactly to Tony’s Saltarelle, via a sound file sent of its notes. When played together, the two instruments blend as one. Despite being only 2/3 the size of the Saltarelle, it’s actually somewhat louder. 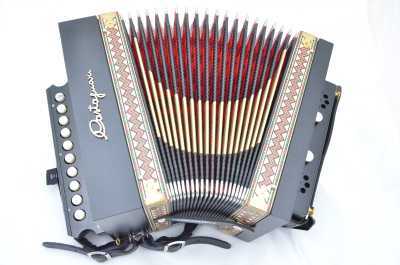 This cajun style single row accordion in D is a classic Hohner model, called the HA114. Judging from the wooden keyboard with the distinctive pointy ends, it was probably made in the 1950s. The instrument has been refurbished by Theo Gibb in England. I’ve refined it further, by adding a balsa rod inside the front cover to prevent the keys from disappearing into the holes (a well known Hohner trait), padding the back strap, adding a cedar block to smooth the back handhold, and installing new bellows, made by Igor Solinc in Slovenia. The instrument is a delight to play, but lags behind its fleet footed (and newer) Italian cousin, the Castagnari Max.